In this readable and beautifully illustrated book, Cary Fowler reminds us of our debt to the world of plants and our responsibility for forward-looking stewardship of the variety of plant life, especially of the genetic variety of those plants that are the foundation of global agriculture. It is a personal and passionate reminder that we should not take our reliance on the world of plants for granted, and that in a changing and unpredictable world, the only way to make sure that agriculture remains productive and is resilient for the future, is to ensure that it is adaptable. This book is a plea for the importance of diversity and the need for action to secure the future of plentiful and nutritious food for all. Along with water, food is a pre-requisite for our continuing human existence. The Svalbard Global Seed Vault is a key component of global efforts to secure the diversity of our most important crop plants to ensure that they meet our needs for the long term, and this book tells us the inside story of how the vault came to be. It is a more complex and nuanced story than the Doomsday Vault” romanticized by the popular press, but in the end the Svalbard Global Seed Vault is an elegantly simple and pragmatic response to a pressing global need. It is an insurance policy for the future of global agriculture. And one that we hope will rarely need to be cashed in. This is an engaging book on a serious subject. The Svalbard Global Seed Vault began only a few years ago as a visionary concept. Today it is reality. Its importance for the long term is hard to overstate. If you doubt it, just stop for moment and reflect on two simple questions: can we afford to take chances with the future of agriculture? And what else that we are creating today will still be relevant, many centuries from now, not just for a select few, but also for all of humanity? Cary Fowler served as the Executive Director of the Global Crop Diversity Trust from 2005 to 2012. The trust's mandate is to ensure "the conservation and availability of crop diversity for food security worldwide." 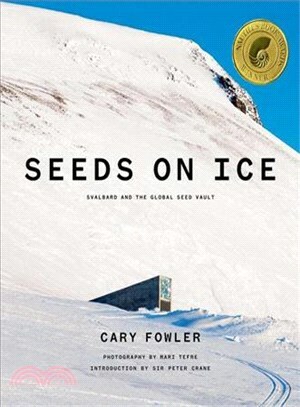 Fowler was influential in the creation of the Svalbard Global Seed Vault. Fowler has received several honorary degrees, including an Honorary Doctorate of Law degree from Simon Fraser University,and an Honorary Doctorate of Humanities degree from Rhodes College. He received the Right Livelihood Award with Pat Mooney in 1985 for his work in agriculture and the preservation of biodiversity. Fowler has also received the Vavilov Medal from the Russian Academy of Agricultural Sciences. In 2010, he was one of ten recipients of the 16th Heinz Awards (with special focus on global change). In 2012, he was awarded the "Wind Beneath my Wings" award jointly with his wife Amy P. Goldman at Bette Midler's annual "Hulaween" party. He was the baccalaureate speaker at the 2013 Rhodes College commencement ceremonies and received the 2015 William L. Brown Award for Excellence in Genetic Resource Conservation from the Missouri Botanical Garden. Sir Peter Crane is currently the dean of the Yale School of Forestry and Environmental Studies at Yale University in New Haven, Connecticut. He is the former Director of the Royal Botanic Gardens in Kew, London. He is a fellow of the Royal Society, a foreign associate of the United States National Academy of Sciences and a foreign member of the Royal Swedish Academy of Sciences since 2002. He was awarded a knighthood on 12 June 2004. Marie Tefre is a Norwegian photographer best known for her work on XLTV (1998), Seeds of Time (2013) and Seed Warriors (2010). In 2003 she moved to Svalbard to work with culture productions and children in the worlds northernmost community, Longyearbyen. She started capturing scenes of the Svalbard nature, society and wildlife. She provided international media with spectacular footage and tv-material from the Arctic in the period 2004 - 2013. Now she is back in Oslo, working with event production at NRK Aktivum.